Recently I've been having the urge to play around with edged pens after years of working only with my Pentel brush and color brushes. I'm basically pretty lazy and don't want to have to clean pens or brushes. I collected a few markers but wanted the metal edge of a pen. 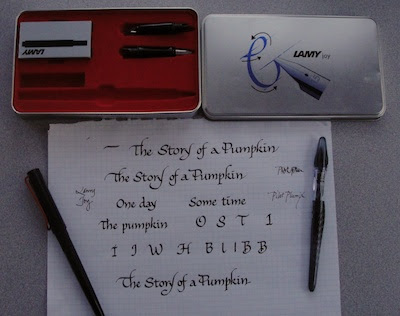 I purchased a Lamy Joy cartridge pen set on our pre-Christmas trip to Montreal, ordered a replacement pen from John Neal when I thought I lost it, and included the Pilot Plumix in the order. I love them both. I'm using the Pilot Plumix as my carry-around pen (the long shaft of the Lamy makes it easy to tumble from a bag) and the Lamy Joy here in the studio. John Neal sells both and although I prefer to get my supplies from him, I wanted to feel connected to the romance of Montreal and purchased it there. I was experimenting with the title page of the Bhutanese-Nepali folktale project, The Story of a Pumpkin.